UFC on Fox 3 is slated for May 5th, 2012 at the IZOD Center in East Rutherford, New Jersey. A headliner has yet to be announced. According to reports, Alistair Overeem has been charged with one count of misdemeanor battery stemming from a late-night incident following his UFC 141 win over Brock Lesnar. UFC on Fox 3 takes place May 5th, 2012, at the IZOD Center in East Rutherford, New Jersey. Less than a week out from UFC on Fox 2, promotion officials are already looking ahead. 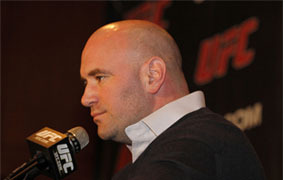 Despite a remarkable run of three events in three weeks, there’s no time for rest as Dana White released the first installment of his UFC 143 video blog on Monday. 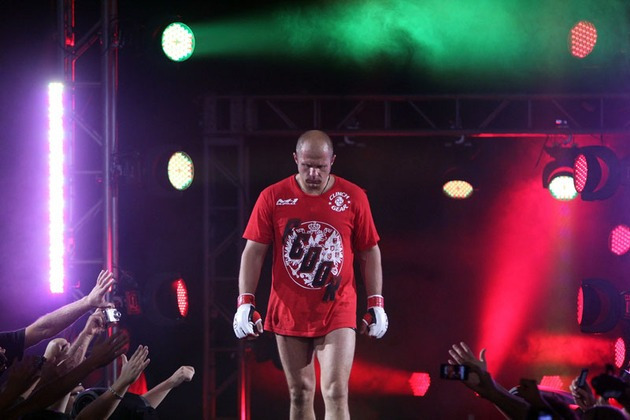 GSP hits the comeback trail, the Gladiator goes out in a blaze of glory, Jimmy Hettes travels to the ’90’s, Fedor wrassles Jung, and lock your doors, it’s Nick Diaz on The Round-Up. MMA Nation Round-Up provides you with daily coverage of the latest in news, multimedia, and analysis throughout the world of combat sports. Today we’ll take one final look back at UFC on Fox 2, before marching forward towards Saturday’s UFC 143 offering. Plus, Georges St. Pierre returns to action, Fedor duels the Korean Zombie, and an interview with the pre-teen that nearly caused a UFC public relations disaster. – Chael Sonnen’s razor-thin victory didn’t quite mesh with the grandiose post-fight speech that followed, but then again, that’s just Chael being Chael… right? The stark exchange led David Castillo to ask: Is Sonnen’s bark beginning to hide his lack of bite? – Catch a recap of all the action of Rashad Evans vs. Phil Davis from UFC on Fox 2’s main event. – Ouch. Regardless, the oddsmakers appear to be on Bones’ side, as the young champion opened as a ridiculously high 6-to-1 favorite. – Cower in fear of Nick Diaz in the latest piece of UFC 143-related viral marketing. – We must all take a moment of silence as we mourn the tragedy that occurred on Monday. After 100+ pay-per-views, the Gladiator has finally fallen in battle. – Somehow, this feels strangely appropriate. – Less than a week away from the UFC crowning a new welterweight champion for the first time since mid-2008, Georges St. Pierre is back in the gym, albiet in a “limited” fashion. – Meanwhile, the Nick Diaz and Carlos Condit camps appear to have a differing of opinions when it comes to the fate of the interim strap. – As if a listless loss to Chris Weidman wasn’t enough, Demian Maia also earned this unfortunate distinction at UFC on Fox 2. MMADecisions.com With his decision loss on Saturday, Demian Maia now solely has the longest active streak of UFC fights going to a decision (7). – Unless your name is Brock Lesnar or Chael Sonnen, it’s hard for an up-and-coming MMA fighter to keep their face in the papers. That’s why Johny Hendricks doesn’t want you to forget, he just blasted the No. 2 welterweight in the world. – B.J. Penn recently hosted a party for the latest group of at-risk youth to join the Penn Hawaii Youth Foundation in Hilo, Hawaii. – Remember that hacker who breached UFC.com and UFC.tv on a live feed and posted the video for the entire internet to see? Yeah, apparently he’s a 13-year-old Australian boy. Hacker extraordinaire S3rver.exe made quite a commotion last week amid Dana White’s online war with Anonymous. Following the release of White’s entire catalog of personal information — including his social security number, phone numbers, and criminal record — the unidentified hacktivist tipped the scales even farther, posting a live video feed allowing viewers to watch as he defaced UFC.com and UFC.tv. After all that, would you believe me if I told you S3rver.exe was only a 13-year-old boy from Australia? That’s right. One of White’s primary “terrorists” can’t even apply for a driver’s license. Softpedia: When and why did you start hacking? S3rver.exe: I started hacking when I was 11. Botnets and Rats inspired me and then a friend introduced me to SQL injection and other hacking stuff. Basically, I started hacking because I saw many videos and news around the world about hacking and then I also wanted to learn. I made heaps of Internet friends and they taught me some tricks. And I guess hacking is my type because I really like computers and I want to get a job in computing. Softpedia: What kind of hacker do you consider yourself to be? Have you always been what you are now? S3rver.exe: I consider myself as a Grey Hat because I like helping out people who are in trouble. I really like Botnets, but I am not that kind of guy who steals money from credit cards and stuff. Yeah, I was always like this. My skills got better and better this year. At first I didn’t really know how to hack but tutorials and videos helped me a lot. Mainly, I am grey hat hacker because I like helping out people, so if they have trouble with anything I can help them, and they can also improve their skills by that. Softpedia: How many sites would you say you’ve hacked so far and how many have you DDOS’ed? S3rver.exe: I have hacked about 150 websites. 81 of the hacked websites belong to the Brazilian and the US government. I don’t like DDOS’ing that much, but this is the part where I use my botnet. I took down about 120 websites including Fbi.gov and Mastercard. I have DDOS’ed many websites with Anonymous, but people were helping DDOS the big sites. Softpedia: Are you part of Anonymous or are you an independent hacker that supports the cause? S3rver.exe: Yeah, I am part of Anonymous. I have taken part in a lot of operations with Anonymous. I first heard about Anonymous when the PSN was hacked and my friend told me that there is a video on YouTube on how to join them. Then I saw their IRC and there was a channel where I asked people if they can tell me how I can help. After I learned how, I helped DDOS websites, and then I learned SQL injection and defacing. Softpedia: Which was the most important site you breached, or the most important operation you were part of? S3rver.exe: I have breached the Administrator of usa.gov yesterday. That was fun. I went through the directories and stuff. Me and my friend Sterlok breached the security. Then I did a live deface on UFC.com and UFC.tv. The live deface was on Tinychat. I was sharing my screen and people were watching me deface. Now I have XSS’ed OPOA, which is the Oakland Police website. I am going to release their stuff soon. So those were really important to me. Softpedia: Do you ever worry about the consequences of your hacking jobs? Most gray hats say they’re not worried because they don’t think they’re doing anything wrong, or they’re not causing too much damage. S3rver.exe: When I breached my first sites, I was like ‘what will happen?’, ‘will I be ok?’, or ‘will I get caught?’, but it’s not that scary now. I always have a reason to hack a website, I am not like just going on a random deface rampage. Tachi Palace Fights 12: Second Coming takes place March 9, 2012, at the Tachi Palace Hotel and Casino in Lemoore, California. John Kim, a veteran grinder who has supported himself and his family for fourteen years playing poker, joins the podcast to talk about what it takes to be a professional. Ryan “g0lfa” D’Angelo joins Kristy to talk about assessing equity and varying your post-flop play.